Cast: Cicely Tyson (Mrs. Watts), Vanessa Williams (Jessie Mae Watts), Blair Underwood (Ludie Watts), Clancy Brown (Sheriff) Keke Palmer (Thelma). 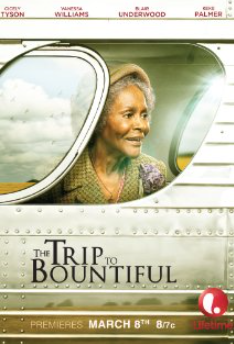 Story: As reported on January 6, 2014 by Broadway World, The Trip to Bountiful is a television adaptation of American playwright and screenwriter Horton Foote’s Tony nominated play. 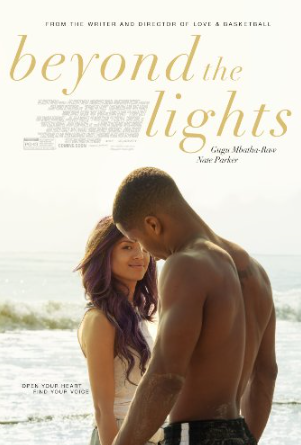 Set during the final years of the Jim Crow South, the film follows one woman’s quest to reconnect with her past in order to ensure her family’s future. In The Trip to Bountiful, Carrie Watts (Tyson, who was awarded with a Tony for her role in the Broadway revival), begrudgingly lives with her busy, overprotective son, Ludie (Underwood) and pretentious daughter-in-law, Jessie Mae (Williams). No longer able to drive and forbidden to travel alone, she wishes for freedom from the confines of the house and begs her son to take her on a visit to her hometown of Bountiful. When he refuses, Mrs. Watts is undeterred and makes an escape to the local bus station, where she befriends Thelma (Palmer), a young woman traveling home. When Ludie and Jessie Mae discover she is gone, they call in law enforcement to help, but Mrs. Watts is one step ahead of them and convinces the local sheriff to help her on her journey home to Bountiful. (Source(s): Broadway World). 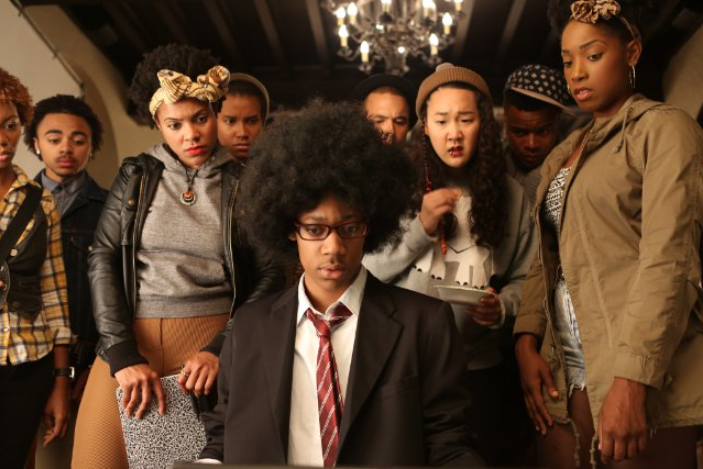 Cast: Mo’Nique (Claire Rousseau), Isaiah Washington (Lance Rousseau), Julian Walker (Randy Rousseau), Lindsay Seim (Libby), Nicole Lovince (Justine), Gary LeRoi Gray (Efrem), Hannah Moye (Chrissie Rousseau), Terrell Tilford (Pastor). 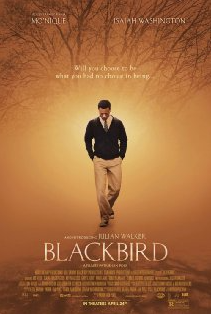 Story: Blackbird revolves around a dysfunctional family in a religiously conservative small Mississippi town. After the young daughter goes missing, the family begins to fall apart. The son, played by newcomer Julian Walker, is a star singer in the church choir, but later comes to realize he is gay – something that does not settle well with the Baptist community. Ridiculed by his mother (Mo’Nique) and supported by his father (Isaiah Washington), the family struggle to stay together as one. Details: As reported in Deadline on January 6, 2014, this is Mo’Nique’s first screen starring turn since the ferocious portrayal as an abusive mother in 2009′s Precious won her the Best Supporting Actress Oscar. Patrik Ian Polk-directed Blackbird, an adaptation of the novel by Larry Duplechan. Mo’Nique is also exec producer with her husband, Sidney Hicks, through Hicks Media. Newcomer Julian Walker plays the star singer in the church choir who feels like a misfit in his high school and struggles with his sexual awakening and the realization he is gay, something that doesn’t land well in a religiously conservative small Mississippi town. This coincides with his younger sister going missing and his parents splitting up. Mo’Nique plays another character who’s not going to win mother of the year awards: the youth’s heartbroken mom, who blames her son’s lifestyle revelation for his sister going missing. Washington plays his supportive father trying his best to help his son’s transition to manhood. (Source(s): Movie Pilot, Deadline). 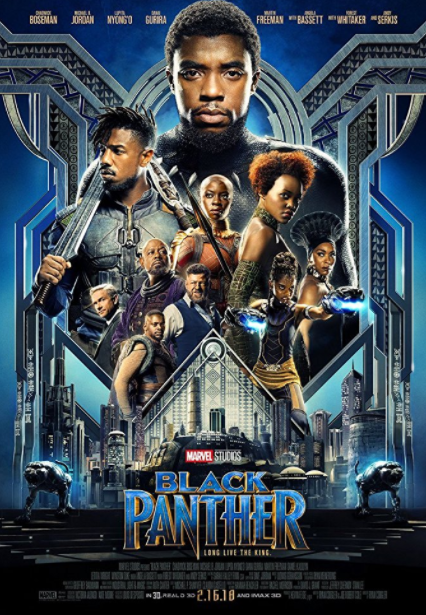 Cast: Chadwick Boseman (T’Challa/Black Panther), Michael B. Jordan (Erik Killmonger), Lupita Nyong’o (Nakia), Danai Gurira (Okoye), Martin Freeman (Everett K. Ross), Daniel Kaluuya (W’Kabi), Angela Bassett (Ramonda), Forest Whitaker (Zuri), Andy Serkis (Ulysses Klaue/Klaw), Florence Kasumba (Ayo), John Kani (King T’Chaka), Winston Duke (M’Baku/Man-Ape), Sterling K. Brown (N’Jobu), Letitia Wright (Shuri). Story: Black Panther follows T’Challa, who, after the events of Captain America: Civil War, returns home to the isolated, technologically-advanced African nation of Wakanda to take his place as King. However, when an old enemy reappears on the radar, T’Challa’s mettle as King and Black Panther is tested when he is drawn into a conflict that puts the entire fate of Wakanda and the world at risk. Source: Black Film. Details: Black Film posted on 6/9/17 that Chadwick Boseman will star as the title hero while Michael B. Jordan will play Erik Killmonger. Lupita Nyong’o is Nakia (a former member of Wakanda’s Dora Milaje, now an agent of Killmonger), and Danai Gurira as Okoye (a member of the Dora Milaje, the all-female security for the King of Wakanda). Winston Duke has the role of the villain M’Baku, aka Man-Ape. Andy Serkis will reprise his role as Ulysses Claw from Avengers: Age of Ultron. Whitaker will play the role of Zuri, an elder stateman in Wakanda. Kasumba will reprise her “Captain America: Civil War” role as Ayo, a member of the Dora Milaje. Kaluuya will play T’Challa confidant W’Kabi while Brown will play N’Jobu, a figure from T’Challa’s past. The Black Panther was created by Stan Lee and the character fought alongside Captain America, The Avengers and The Fantastic Four. The Black Panther is considered the first black hero in mainstream comics. On 10/28/14, Variety reported, after breaking out as Jackie Robinson and James Brown in 42 and Get On Up, Chadwick Boseman has a new high-profile role to play: T’Challa, otherwise known as the superhero Black Panther. The character is notable for being the first black superhero in mainstream American comic books. The king of the fictional nation of Wakanda, T’Challa joined the Avengers in 1968. He will be prominently featured in costume for the first time in Captain America: Civil War, to be released May 6, 2016, before being spun off into his own film on November 3, 2017. The Civil War is a big storyline, based on all of the other Marvel films, particularly Captain America: The Winter Soldier and The Avengers: Age of Ultron. Wakanda has the world’s largest deposits of vibranium, a highly durable meteoric ore that is used to create the mesh in Black Panther’s costume and Captain America’s shield. The material will play a larger role in future Marvel movies. But so will Black Panther, a character that has long been in Marvel’s plans as a potential franchise. After Black Panther, the character is also expected to join the rest of the Avengers in sequels to that franchise, which is being broken up into two films in 2018 and 2019. Boseman has inked a five-picture deal with Marvel, according to sources. Source: Variety. Story: A dedicated young lawyer becomes the only white member of the NAACP Legal Defense Fund and fights side by side with Thurgood Marshall in the courts to destroy segregation. The landmark 1954 Supreme Court case of Brown v. Board of Education helped to end segregation in schools. Details: Based on the Jack Greenberg’s “Crusaders in the Courts.” (Source: Movie Insider.com). Cast: Don Cheadle (Miles Davis), Ewan McGregor (Dave Brill), Emayatzy Corinealdi (Frances Taylor), Keith Stanfield (Junior), Michael Stuhlbarg (Harper), Lakeith Lee Stanfield. Story: A remarkable portrait of Davis, refracted through his crazy days in the late-70s. Holed up in his Manhattan apartment, wracked with pain from a variety of ailments and fiending for the next check from his record company, dodging sycophants and industry executives, he is haunted by memories of old glories and humiliations and of his years with his great love Frances Taylor (Emayatzy Corinealdi). Source: Blackfilm. Update: On 7/26/15 The L. A. 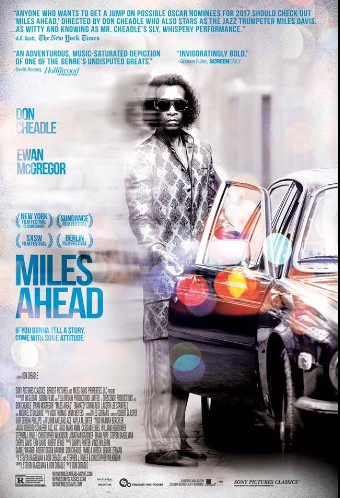 Times reported that Don Cheadle’s Miles Davis tale Miles Ahead will make its world premiere at The 53rd New York Film Festival’s closing night on Oct. 11. Cheadle directed the film, his first such effort, and also co-wrote the script and stars as its lead character. The film does not yet have U.S. distribution, a break from recent tradition in which NYFF world premieres are studio award hopefuls for the current season. In fact, the film was partly financed by an IndieGogo campaign. In making his case for contributions, Cheadle explained his motivations and approach. Emayatzy Corinealdi stars as longtime love interest Frances Taylor and Ewan McGregor as a man who finagled his way into Davis’ apartment. Source: L.A. Times. 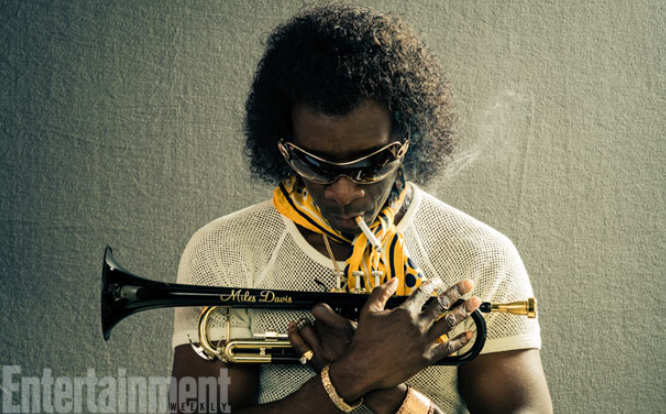 Update 7/20/14: In an Entertainment Weekly 7/7/14 exclusive of the actor in character, Cheadle gave fans a first look at his interpretation of the icon during the period leading up to his 1969 jazz-rock fusion recording In a Silent Way. From June 3, 2014 to July 10, 2014 Cheadle’s Indiegogo campaign surpassed it’s goal of $325,000, raising $343,496. Photo Source: Entertainment Weekly; Source(s): Entertainment Weekly, Indiegogo.com. “Music has always been one of my passions. Since 6th grade, when I started listening to my parents’ Miles Davis records, his artistry has been an inspiration to me; he was someone who only ever followed a path as a runway to create a new one. Surprisingly, Miles’ life, his passion, his creativity, his fire have never been brought to life in a film and the fact that his family has chosen me to do this now is an honor. I want to tell a story that Miles himself would have wanted to see, something hip, cool, alive and AHEAD. I’ve taken my marching orders from Miles’ mandates (“Play what’s not there.” “Fear no mistakes. There are none.”) and focused in on a very specific point in his life to explore his relationship with his muse, his voice, his fears and challenges to come out of his silent period and return to the music. I’m hopefully making a movie that tells a story many people can relate to, jazz fan or not. Cheadle will direct and is producing the film through his Crescendo Productions banner, along with Bifrost’s Daniel Wagner, and Robert Ogden Barnum. Also producing are Darryl Porter and Vince Wilburn on behalf of the Davis estate, Lenore Zerman and Pam Hirsch. It was previously reported that Zoe Saldana was to play the musician’s ex-wife, Frances Taylor, but due to a scheduling conflict she has since been replaced by Emayatzy Corinealdi. (Sources: Indiegogo, Shadow and Act, Cincinnati.com; Photo Source: Indiegogo.com).